Are you playing hand tango every time you stand at center barre? It can be annoying when you’re trying to work and someone else’s hand has a death grip on the barre space that’s logically yours. Here’s a tip to improve your hand switcheroo and maybe teach your barre mates some hand placement etiquette. Depending on the size of the barre will determine how many people can share the space. Ideally you should be able to fully extend your leg forward and back without touching your neighbor. If you’re in a crowded class you may have to compromise some space. Place your left hand on the barre. This will automatically arrange one side of the barre facing one direction with the other in the opposite. Now make sure that you’re staggered. The person in front should place their hand closest to the end of the barre. This will allow freedom to slide you hand along the barre during a combination. Allow 5-8 inches between your hand and your neighbors that’s face in opposition. After completing a combination on the first side, rise to sous-sus. As you turn into the barre both arms find first position. Continue your rotation to face the second side. Now you should automatically be in the correct position. Once again, the person in front should have their hand closest to the end. In my experience set-up is key. 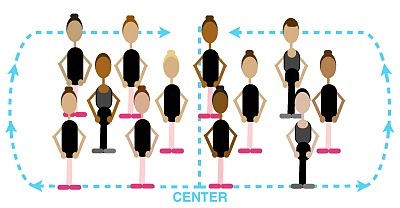 If your at a center barre and notice people aren’t setting up correctly, be an example. Prior to class beginning, ask your barre mates to shift to fulfill proper placement. After the first combination you’ll be happy you did and hopefully they will be too. Yes, it’s true. There is an etiquette when it comes to drinking water! Some school are strict about their water policies, while others are not. Even if a school is not specific, there are those unspoken rules that exist. In this article you’ll learn when it is appropriate to drink water, when it is not, and other general thirsty dancer tips. Be Prepared…Bring A Water Bottle! Asking your teacher to leave class for a drink of water is disruptive. If you can’t make it through class without drinking water, it’s imperative that you bring your own water bottle. Always write your name on it, and keep it close but out of the dancing space. Check out my suggestion on the best water bottle by CLICKING HERE! To Drink, Or Not To Drink At Barre? There a few schools of thought about this one. Some teachers are okay with students taking a quick swig of water between combinations, while others prefer for student to wait until barre is complete. If you’re unsure what’s acceptable, my best suggestion is ask the teacher prior to class if there is a preference or a rule. Otherwise you can take a quick drink, but know the combination, and be ready to start before the music begins. While I Wait, Can I Have A Water Break? As class progresses and you begin to move across the floor, most schools and teachers do allow students to rehydrate, especially during warm summer months. However, you still must know the combination and be ready to dance with your group. Room Temperature H2O + And Small Sips = Happy Dancers! For all athletes it’s important to drink room temperature water when performing. Cold water might feel refreshing, but it uses more energy and can make you feel tired. This is because your body has to work harder to warm the water up to your body temperature. Also, small sips are better than large gulps… Nothing is worse than petite allegro with water sloshing around in your stomach! Ballet hands should appear as an extension of the arms: relaxed, fluid, and elongated. Shake out your hands and rest them at your sides. Naturally, your thumb will fall into the place, relaxed and inline with the index finger. Now lift the index and little finger slightly higher than the middle two fingers. Voila! A beautiful ballet hand! Still need more assistance? Try placing a chopstick, pen, or pencil under the index and little finger. This will help you feel the placement with ease. Dancers Beware! Over-thinking and tension can make your hands look like a Ballet Frankenstein. Avoid: stressing the fingers, breaking at the wrist, pressing your fingers together, and “hitchhiking” your thumb. Buy This For Ballet Class, Not That! Congratulations, you’ve signed your budding ballerina or ballerino up for class, now what? First things first, time to buy the necessary clothing and shoes. Check with your school prior to venturing off to Target, Walmart, or Sears. Many schools have a specific dress code and can recommend a dance wear store for all of your purchasing needs. Dance wear stores are experts when it comes to finding the right leotard, tights, and shoes. It may be tempting to find a cheap imitation, but there’s a lot to be said about quality when it comes to dance wear. Every year I have students dressed in attire from a retail store. I can’t deny they are cute, but these outfits are more for play than taking class. Many of the leotards have accents that fall off, tear, or press into the body during exercises and stretches, which can hurt a child. However, the worst part of these outfits are the shoes. These silky slippers are NOT ballet slippers. They are house slippers, and they’re the biggest threat to your child. They fit loose and don’t promote proper foot use for ballet. As a teacher, I can guarantee that students who wear these shoes will slip, trip, and fall within the first fifteen minutes of class. When it all comes down to it, save your money and the tears; buy your child’s dancewear from a dancewear store! Can’t find a local dance wear store? Try these online stores. If you have questions, there’s always a helpful representative standing by! After barre, students scatter to the middle of the room for center. After quick negotiations, lines are formed and class continues. Just like in sports, no one likes a ball hog, and in ballet, no one likes a mirror hog. It’s only fair for you and your peers to change lines. Most teachers will cue the class when it’s time to change lines, which usually takes place between combinations. However, there is a technique to switching efficiently. In todays etiquette tip, I’ll show you how. 1. Make sure you’re aligned at least an arms length aways from your neighbor. This allows the second and additional rows to place themselves in the windows between people. Now everyone can see themselves in the mirror! 2. After finishing the combination, figure our which side of center you are on. If you’re right of center, then you’ll need to circle around to the right or vice versa if you’re left of center. 3. At this point, the front line splits in the middle and begins to walk along the outside of the group. As the front line shifts, the remaining lines step forward to replace the line in front of them. 4. Now, the dancers who were in the front line have rotated to the back and everyone else has shifted forward. With this changing line technique, every student will be seen and have a change to stand on the outside and middle of the line. Everyone learns in different ways and according to www.learning-styles-online.com, there are seven defined styles. They include visual, aural, verbal, physical, logical, social, and solitary. 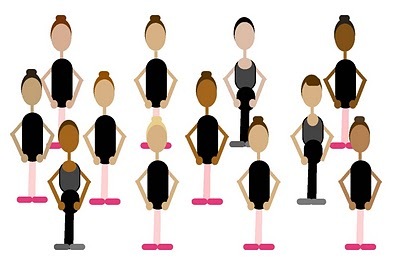 In the dance world, we rely heavily on the majority of these styles. However, students are usually discourages to use their voice in a dance class. In this blog, I intend to help you know when it’s okay to talk and ask question in class. As an inquisitive young dancer, I was often told “this is not the time for questions” or “shhh!” Needless to say I was usually embarrassed and felt reprimanded for trying to understand. Gradually I did learned when to ask questions and what was appropriate to ask, but it wasn’t until I began teaching that I fully mastered the art of asking questions. 1. Is your question more of a comment or realization? Yes – Then keep it to yourself. Write it down in a notebook or share it with a friend after class. 2. Does your question pertain to the order of the choreography? Yes – Raise your hand and ask for the teacher to repeat the combination. *Note* Never say you don’t get it. Teachers hate to hearing that statement. So formulate an intelligent question about what you don’t understand. 3. Do you have a question about how to perform a particular step? Yes – Chances are your not alone, especially if it’s a new step or a tricky transition. Raise you hand and ask the teacher to perform that step slower. If you’re still having trouble after completing the exercise, make a mental note. Then, at the end of class try practicing the step on your own or find a friend to practice with you. 1. Has your teacher shown the combination several times and you still don’t understand the transition or order? Yes – Here’s a situation where you need to access the environment. Since your teacher has repeatedly gone over the combination and you’re still stuck, it’s up to you to find the answer to your question. If you don’t know what you’re doing, by all means don’t go first! Find a place near the end of the line to watch and practice with the first few group. 2. When you went across the floor did you bump into someone? Yes – After you have finished the combination across the floor, you can quietly apologies and see if you can adjust your position for the next time around. *Note* People bump into each other all the time. Don’t make a big scene by shouting sorry or another sh-word while dancing. 3. Has class finished and you’re still not satisfied with a step or correction? Yes – Now’s your chance for some real one on one time with your teacher. Approach them after class and ask if they have a moment to help you out. Even if the teacher is unavailable at the time, letting them know your concern will make them aware to watch you next class. Always remember to access the question and environment before asking. Class time is limited, so weeding out questions that can be answered by observation should be kept to yourself. If for some reason your teacher did not see you had a question, only then is it okay to quietly ask your neighbor. However, I caution you to do so only at the correct time. For example, as you’re walking to the corner to prepare for a combination or if the teacher gives you prep-time to practice. Questions are a part of the learning process. To ignore or to discourage verbal interaction in class is a little old school, but it still exists in some places. If you’re being respectful and still feel like you can’t ask a a question, then maybe it’s time to seek out private classes or a new studio. In ballet class most people tend to introvert, focusing on their practice. This is understandable, we’re all trying to better ourselves. However, sometimes our self reflection can go too far and it shows in our body language. To a teacher it may appear that your not listening or have a bad attitude and believe me, that’s not a good thing. Good teachers love giving information and helping students. So take a minute and reflect, do you show too much inward reflection durning class? Don’t cross your arms – To a teacher it appears that you’re close-minded or don’t like what they have to say. Don’t sit into one hips – Again this can appear to the teacher that you don’t care. Don’t get angry at yourself – From a teachers perspective, it looks as though you are too emotional to try their suggestion. Do try their corrections – Don’t just stand there, do it! Teachers love it when you take action and practice. Do stay active – Ask question, of course wait until the appropriate time. But, chances are if you’re confused you’re not alone. As Martha Graham once said, “The body never lies.” So stay alert and actively take class. 1. 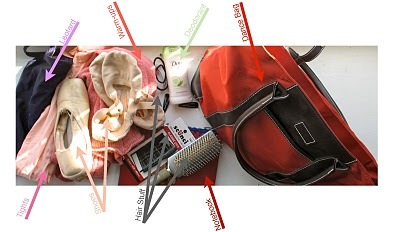 It allows you to check-in, get dressed, secure your hair, and prepare your body. 2. You’ll have time to situate your barre placement. 3. It will help prevent injuries. 4. Plus, it shows respect for the teacher. Here are some things to consider to help you arrive on time. 1. Pre-pack your dance bag the night before and don’t forget a snack! 2. Set a pre-class alarm to remind you to get going or to prep the kids. 3. Multitask, put your hair up during you commute or loosen up with a few head and shoulder circles. 4. On harsh weather days, allow for extra commute time. Okay, let’s say you’re having one of those days. Here’s how to appropriately enter the classroom without being a distraction. 1. Stand outside of the door and make eye contact with the teacher. While waiting for approval, scan the room for a good place to stand. 2. Enter the studio between combinations. 3. Quickly take your place and warm-up with a few plié and grand plié’s. When it all comes down to it, arriving early is respectful to your fellow classmates, teacher, and especially yourself.